Written as a cultural weapon and a call to arms, Howl touched a raw nerve in Cold War America and has been controversial from the day it was first read aloud nearly fifty years ago. This first full critical and historical study of Howl brilliantly elucidates the nexus of politics and literature in which it was written and gives striking new portraits of Allen Ginsberg, Jack Kerouac, and William Burroughs. 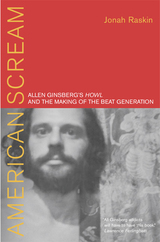 Drawing from newly released psychiatric reports on Ginsberg, from interviews with his psychiatrist, Dr. Philip Hicks, and from the poet's journals, American Scream shows how Howl brought Ginsberg and the world out of the closet of a repressive society. It also gives the first full accounting of the literary figures—Eliot, Rimbaud, and Whitman—who influenced Howl, definitively placing it in the tradition of twentieth-century American poetry for the first time. As he follows the genesis and the evolution of Howl, Jonah Raskin constructs a vivid picture of a poet and an era. He illuminates the development of Beat poetry in New York and San Francisco in the 1950s--focusing on historic occasions such as the first reading of Howl at Six Gallery in San Francisco in 1955 and the obscenity trial over the poem's publication. He looks closely at Ginsberg's life, including his relationships with his parents, friends, and mentors, while he was writing the poem and uses this material to illuminate the themes of madness, nakedness, and secrecy that pervade Howl. A captivating look at the cultural climate of the Cold War and at a great American poet, American Scream finally tells the full story of Howl—a rousing manifesto for a generation and a classic of twentieth-century literature. Jonah Raskin is Professor and Chair of Communication Studies at Sonoma State University. Among other books, he is author of For the Hell of It: The Life and Times of Abbie Hoffman (California, 1997) and My Search for B. Traven (1980). 3 Trilling-esque Sense of "Civilization"